This is taken from Sentinel News, a newspaper serving Northern Utah. We have corrected a couple of small errors in the information which will be bracketed. 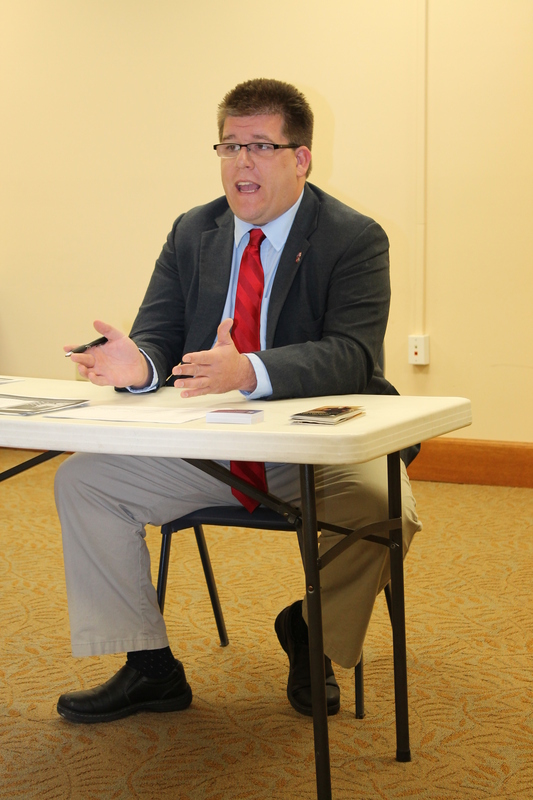 Craig Bowden,an Independent candidate for the 1st Congressional District, held a “Meet the Candidate” meeting at the Brigham City Library on 25 January. During that meeting, he fielded questions from the audience and expressed his views about what was wrong in Washington,D.C. ; and how he could contribute to changing the current political climate there. He explained that he decided to run because he was tired of the bickering in Washington, D.C. between the two main political parties for control of the federal government instead of concentrating on the needs of Americans. Being a disable [Marine] veteran, he feels gives him a unique understanding on veteran affairs and military concerns, which would enable him to address the needs of our military in and out of service. He feels that the Veterans Administration needs to be streamlined and that there are better ways to connect the VA with those coming out of service and helping the veterans with disabilities transition into civilian life again. “I feel that certain injuries, such as brain injuries caused by explosions, that should immediately get a 0% rating,” said the young man, “so veterans when discharged can have immediate access to health care instead of waiting years to have access to the care they need.” He went on to explain that many veterans’ conditions are deteriorating while waiting for the help they need due to an inefficient bureaucracy. Craig feels his ideas would most likely save the VA money in the long run and help the veterans transition back to civilian life quickly and smoothly. He feels that immigration is a simple issue to solve by enforcing current laws on the books and finish building the wall (that was passed into law in 2006) on the southern border that is just over 20% completed. “They [immigrants] need to come here legally and the government needs to be accountable that this is being done,” said Mr. Bowden. He also feels there needs to be an improved and expanded oversight committee to keep government agencies in check and hold leaders of those agencies accountable for their spending decisions. He feels this will get rid of the current mentality that if there is money left over at the end of the year it has to be spent in order to get the same budget next year. The Federal Reserve has almost no oversight as well, according to Mr. Bowden. He feels the FR needs to be eliminated and he pointed out that it is not the role of the FR to decide to print money – that it should be in Congress’ hands to decide that. Mr. Bowden feels a “Fair Tax” needs to be initiated. “I think an end-user tax should be instituted,” he claimed. “If you buy more, then you’ll pay more in taxes.” His idea is that this tax would fluctuate year after year based on the spending habits of Americans causing Congress to run off a working business model that requires spending control in order to meet the expected budget. With a “Fair Tax,” all other taxes would be eliminated and there would be no need for the Internal Revenue Service. Mr. Bowden served nearly eight years in the U.S. Marine Corps as an infantryman. He completed two combat tours to Iraq, served advisement missions to Morocco, trained over 2,000 Marines and several hundred multi-national allies. The young man worked three years in the business division of the IRS, giving him insight into what needs to be done to fix the problems with the IRS. He is the author of “Common Sense: How to Restore America” and is a self-employed business owner. Craig is a father of two [sons and a daughter] and engaged to to be married and be a step-father to two boys. If you would like more information about Mr. Bowden, or contact him, you can go to his web page http://www.Craig4Congress.org.